Great for breeders or school mascots. Send your client home with a replica of the dog they want. 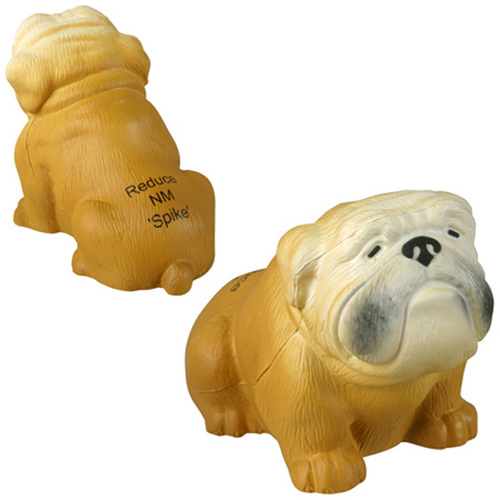 Bulldog Stress Balls are made of Squeezable polyurethane foam. Never give up on business, send out the Bull Dog Stress Ball to the rescue.Giveaways can be fun and have a message as well. The dog that England, U.S. Marines and universities chose to represent their tough, tenacious characters. Perfect for veterinarian offices and shelters, these bulldog shaped stress relievers will be their best friend when feeling stressed! They also make a great giveaways at trade shows and pet conventions. Add your custom imprint for brand awareness. Safety tested, this 1 3/4" x 2 1/2" x 4" stress reliever is intended for adults or for general use by consumers of all ages. Our products are not intended for children under three years old or for pets. 4" x 1-3/4" x 2-1/2"
Bulk / 22 lbs / 250 pcs. / 24x14x15box.